Is it Fair to Strike? What is going on with BART? In 2001, a strike was threatened, and BART employees received a 22 percent raise over the four year period from 2001 to 2005. In 2009, BART employees negotiated a contract that gave no raise for the following four years. When an agreement wasn't reached by July 1st, 2013, the BART unions held a 5 day strike immobilizing many in the Bay Area. The strike only ended because the Governor instituted a 60 day cooling off period. The major points of contention for the unions are pay raises, reduced employee contribution to pensions, medical benefits and safety. We have collected many news articles for more context. 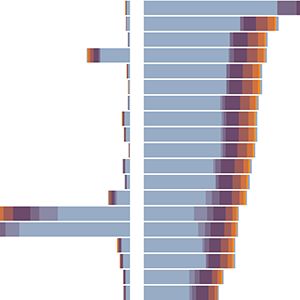 The salary data is a herculean Open Data effort from Mercury News and the Bay Area News Group. Victor asks: How Much Do BART Employees Earn? 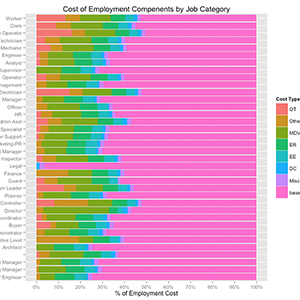 This visualization allows you explore each BART employee in terms of their costs of employment, such as base salary, overtime pay, health benefits, 401(k), and pension contributions. Hyon asks: are the demands reasonable? 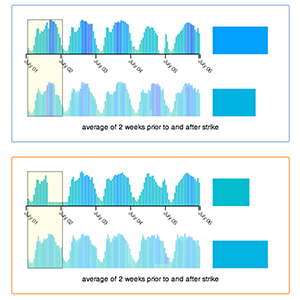 Hyon asks: is a strike neccessary? Following up on his earlier post Hyon takes a look at new proposal numbers and explores the issue of overtime pay. Antony asks: How Much Do BART Employees Cost? 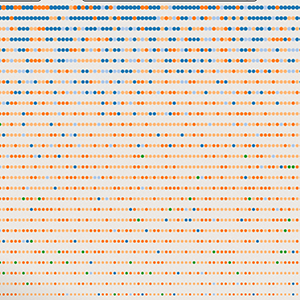 Click thru to an interactive look at who rides where. 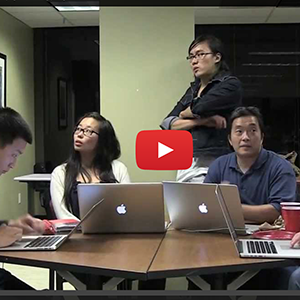 We co-hosted 2 events with the VUDLab @ UC Berkeley to work on this project. 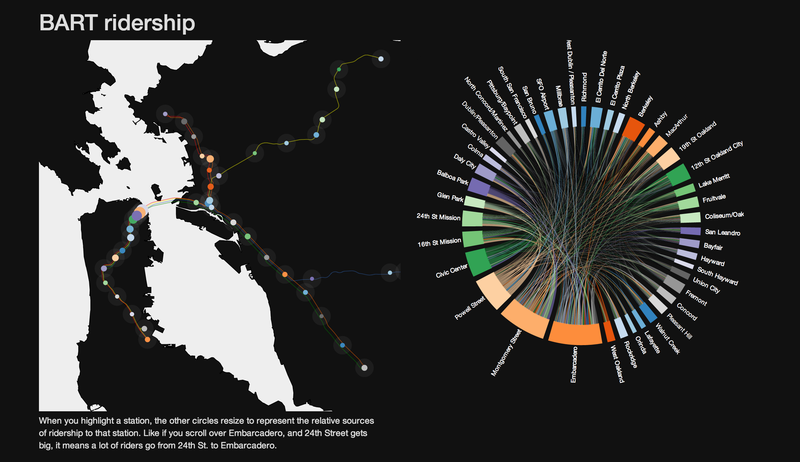 The VUDLab is all about visualizing urban data and brought a lot of transportation expertise. Special thanks to Halftone for helping design and build this website. Special thanks to our videographer Matt who does a great job filming our meetups. A lot of work went into collecting the data used in the above projects. 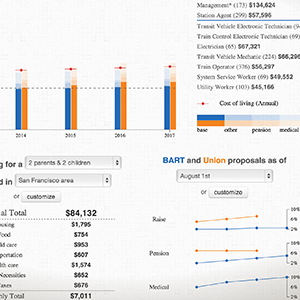 The project started when Ian asked EJ, Paul and Erik to help him find data about the BART after the strike in July. After building up a repository and several visualization prototypes and speaking with Lewis and the VUDLab we decided to get the d3 meetup involved. At the hackathons lots more data came in! James and Ben got cost of living data together. We also got a ton of hard to find links to public/open data from a furloughed government employee who needs to remain anonymous but deserves to be thanked! 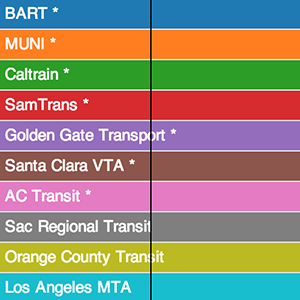 How much do BART employees earn? 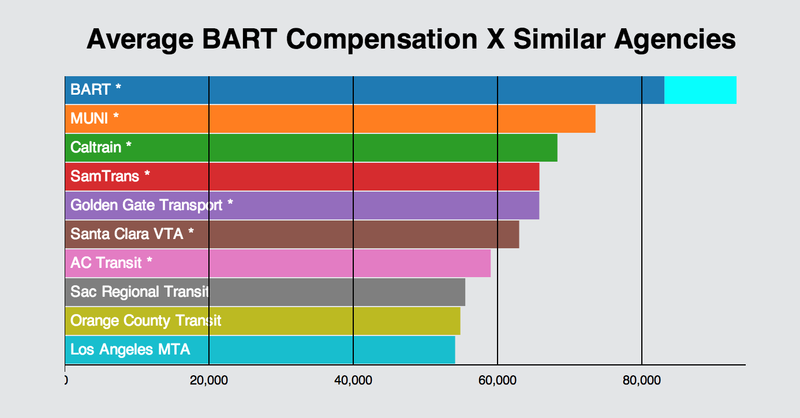 How much do BART employees cost?